Darryl Andrew Kile (December 2, 1968 – June 22, 2002) was an American Major League Baseball starting pitcher. He pitched from 1991 to 2002 for three different teams in his career. In his first season for the Cardinals, he won 20 games in 2000 as the team reached the postseason for the first time in four years. They advanced to the playoffs in the next two seasons. Kile was known for his sharp, big-breaking curveball. He died of coronary disease in Chicago, where he and the Cardinals were staying for a weekend series against the Chicago Cubs. He was the first active major league player to die during the regular season since 1979, when the New York Yankees' Thurman Munson died in an aviation accident. Kile was selected by the Houston Astros in the 30th round of the 1987 Major League draft. Having been successful with the Tucson Toros, the Astros' AAA club in the Pacific Coast League, Kile entered the majors in 1991, going 7–11 in 22 starts. In his first major league start on April 24, 1991, Kile had a no-hitter going when he was lifted after six innings by manager Art Howe, who wanted to protect the 22-year-old rookie's arm. Kile's breakthrough year came in 1993 when he went 15–8 with a 3.51 earned run average and made the All-Star team. On September 8, Kile pitched a no-hitter against the New York Mets. He pitched seven seasons with the Astros, mostly as a starter. Another strong season was 1997, when he went 19–7, compiled a 2.57 ERA, made the All-Star team again, threw a career-high 255 2⁄3 innings, and pitched four shutouts. He finished fifth in voting for the NL Cy Young Award. Kile made his first postseason appearance in Game 1 of the 1997 National League Division Series against the Atlanta Braves, giving up only two hits but suffering a hard-luck 2–1 loss. Atlanta swept Houston in the best-of-five series. In 1998, Kile signed with the Colorado Rockies as a free agent. Kile suffered control problems, allowing hitters to lay off his curveball. After two seasons in which he was a combined 21–30 and posted ERAs of 5.20 and 6.61, Kile was traded to the Cardinals. In his first season with St. Louis, Kile went 20–9, becoming the first Cardinal pitcher since John Tudor and Joaquín Andújar in 1985 to win twenty games in a season. He made his third All-Star team and again finished fifth in NL Cy Young Award voting. He earned the first playoff victory of his career in Game 2 of the 2000 NLDS against Atlanta, but suffered two losses in the NL Championship Series, which the Cardinals lost to the Mets in five games. Kile went 16–11 in 2001, and the Cardinals made the playoffs again, losing to the eventual world champion Arizona Diamondbacks in the NLDS. (Kile got a no-decision in his Game 3 start). Kile threw 227 1⁄3 innings and compiled a 3.09 ERA that season, despite having an injured shoulder which required surgery after the Cardinals were eliminated from the playoffs. He spent the offseason rehabbing and was ready for the start of the 2002 season. In twelve seasons as a major league pitcher, Kile never went on the disabled list. On June 18, Kile pitched in an interleague game against the Anaheim Angels, scattering six hits over seven and two-thirds innings, allowing one run. He exited the game in the eighth inning to a standing ovation. Kile and the Cardinals won the game, 7–2, and moved into first place in the NL's Central Division, a spot they would hold on to for the rest of the 2002 season. That same day, longtime Cardinals broadcaster Jack Buck died. On June 22, 2002 during pregame warmups for what would have been a day game in Chicago against the rival Cubs, team personnel noted Kile's absence. Hotel staff entered Kile's room and discovered him in his bed, under the covers, dead of a heart attack. An autopsy determined that the cause of death was a 90-percent blockage in two coronary arteries. The details leading up to and following Kile's death are detailed to some degree in Buzz Bissinger's book, Three Nights in August. An entire chapter is dedicated to Kile. Cubs catcher Joe Girardi announced at Wrigley Field that the afternoon's game versus the Cardinals had been canceled, though he did not announce that the cancellation was prompted by Kile's death. Girardi tearfully gave the news at 2:37 p.m. CDT, broadcast regionally on Fox: "I thank you for your patience. We regret to inform you because of a tragedy in the Cardinal family, that the commissioner has canceled the game today. Please be respectful. You will find out eventually what has happened, and I ask that you say a prayer for the Cardinals' family." The game was rescheduled and made up later in the year on August 31, a 10–4 Cardinal defeat. Jason Simontacchi, who pitched for the Cardinals, was visibly emotional during the game since Kile was a mentor to him. Later that season, when the Cardinals clinched the Central Division championship in a game against the Astros, teammate Albert Pujols carried Kile's #57 jersey, on a hanger, to the celebration on the field. Kile was survived by his wife, Flynn, his twins, daughter Sierra and son Kannon, and son Ryker. The Cardinals honored Kile by placing a small "DK 57" sign in the home bullpen. This sign was carried over to the new Busch Stadium and remains today. The team wrote "DK 57" on their hats. The team put chalk and markers in the Busch Stadium concourses so fans could write similar messages on their caps. In the All-Star Game, former pitcher Matt Morris wrote DK 57 on his hands and held them up when they announced his name in honor of his fallen teammate and close friend. Since Kile's death, the Astros, Rockies, and Cardinals have not assigned number 57 to another player, although none of those teams has formally retired the number. The Astros honored Kile with a memorial plaque that hangs along the left field wall at Minute Maid Park under the 1997 Central Division Championship banner, the last season Kile played for Houston before signing with Colorado. The Rockies have a memorial near the bullpens. It is circular, says "DK 57", and is on pinstripes. In 2003, the Darryl Kile Good Guy Award was established and is presented annually to the Astros player and Cardinals player who best exemplify Kile's traits of "a good teammate, a great friend, a fine father and a humble man." The winners are selected, respectively, by the Houston and St. Louis chapters of the Baseball Writers' Association of America. The first recipient of the award on the Astros was Jeff Bagwell. The first recipient of the award on the Cardinals was Mike Matheny. Kile was given an exemption by the Baseball Writers' Association of America and placed on the ballot for the Baseball Hall of Fame in 2003. With seven votes, he was eliminated from future BBWAA ballot consideration. ↑ Leach, Matthew (June 21, 2007). "Kile's impact felt five years later". MLB.com. Retrieved 2009-08-05. ↑ "BASEBALL; Coroner Verifies the Cause Of Kile's Death as Natural". New York Times. July 17, 2002. Retrieved July 22, 2012. ↑ Leach, Matthew (June 26, 2002). "Memorial service for Darryl Kile held at Busch Stadium". MLB.com. Retrieved 2009-08-05. 1 2 Darryl Kile Award. Baseball Almanac. Retrieved 2011-08-14. ↑ Footer, Alyson (June 23, 2002). "Jeff Bagwell remembers his good friend, Darryl Kile". MLB.com. Retrieved 2009-08-05. Bissinger, Buzz (2005). Three Nights in August. Houghton Mifflin. ISBN 0-618-40544-5. Contains a chapter about Kile. See Excerpt at National Public Radio. 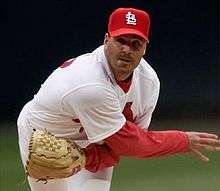 History: Tributes: Darryl Kile (December 2, 1968 – June 22, 2002). MLB.com. MLB Advanced Media, L.P.